I was about to post about Daniel Shiffman’s new MPE (Most Pixels Ever) Library, when what should appear in my Processing Blogs subscription, but an extended video showing more of the ITP lab, and The Shiff (first ever rockstar processing nickname? I hope so) himself talking about the project. Preface: If you love Processing – as we do here at CDMo – then you should already be subscribed to ProcessingBlogs, and have probably already seen this. However it’s too cool not to add to our Processing.org tag page. Hence this post. Ã¢â‚¬Å“Most Pixels EverÃ¢â‚¬Â (not to be confused with Ã¢â‚¬Å“Best Pixels EverÃ¢â‚¬Â) is an open source Java framework for spanning real-time graphics applets/applications across multiple screens. The above video is a quick demonstration of the first prototype. Three client applications on three Mac Pros connect to six 32 inch LCD displays (each Mac has a dual video card, but this could just have easily work with 6 client machines). One of the Macs is also running a server application. The server tells each client about the master pixel dimensions of all the screens combined (here 8160Ãƒâ€”768). The client keeps track of its own location dimensions (say 2720Ãƒâ€”768) as well as its location with in master dimensions (say 5040,0). 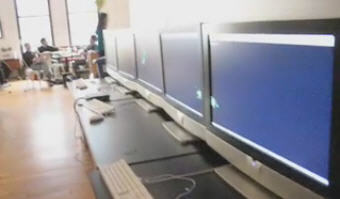 The server keeps everyone in line, making sure that frames are rendered in sync. We’ve had a couple of people in the CDM Forums asking about multi-screen projections and video installations. It’s a logical progression for advanced projects – there aren’t many things which won’t look considerably more awesome if spread over multiple screens – but hasn’t really been an option thus far in Processing, unless you were to go the hardware multiple-monitor route. To the video: Tech Trek: Inside ITP (episode 2) (3 minutes).